This is so much prettier in real life! The photo doesn't do it justice. The gown is stamped on vellum in white Craft and embossed with white detail ep. 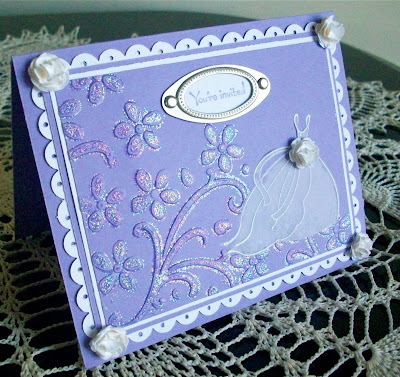 I took my Versamarker pen and colored in the 'deep' side of the Elegant Bouquet Textured Impressions folder, then I heat embossed it using Iridescent Ice ep. The flowers were made by using Cherie Franklin's tutorial in the April issue of the Paper Crafters Sampler. Wow! This stamp is not at all my style, but the things you have done with it make me think I want it!